Do you have a minute to spare to learn some English? Saskia takes us through the who, what, where, when and why of question word + ever. Give us 60 seconds and we'll give you the English! Hi, everyone. 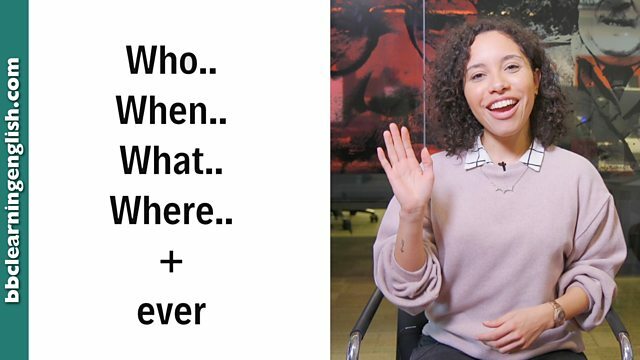 I'm Saskia and in this episode, we're going to look at what it means when we add the word 'ever' to the end of a question word. The most important thing to know is that when we add 'ever' to a question word, it's not talking about anything specific. It often means we don't know the who or the where, or they are not important. Let's look at some examples. Whoever ate my cake is in big trouble. This example means that 'I do not know who ate my cake'. Whenever I go to the cafe, there are never any sandwiches left. This means 'the time when I go to the cafe is not important'. I never put on weight, so I can eat whatever I like. This means 'what I eat isn't important'. The puppy followed the girl wherever she went. By adding 'ever' to 'where' it means 'the place is not important'. So if you want to say the time, place, person or thing you're talking about is not important or unknown, just add 'ever' to the correct question word. Adding 'ever' to a question word means that we aren't talking about anything specific. It often means that we don't know the person, time, thing or place, or that these things are unimportant. Whoever is used for a either a person we don't know, or a person that it is unimportant to name. Whoever ate my cake is in big trouble. No one is allowed inmy bedroom - whoever you are. Whenever is used for a either a time we don't know, or an unimportant time. Whenever I go to the cafe, there are never any sandwiches left. I can't remember. Whenever we went, it can't have been more than a month ago. Whatever is used for a either a thing we don't know, or an unimportant thing. I never put on weight, so I can eat whatever I like. Whatever's walking behind us sounds like a big animal. Go quickly. Wherever is used for a either a place we don't know, or an unimportant place. The puppy followed the girl wherever she went. I can't find the cafe again. Wherever it was, it was a great cup of coffee. What is the general effect of adding 'ever' to a question word? Complete this sentence with the correct word: I can hear a strange noise. ______ it's coming from, I wish it would stop! Adding -ever can mean we don't know who or it doesn't matter who. What does this sentence mean: Whoever's calling will have to phone again later. I don't have time right now.